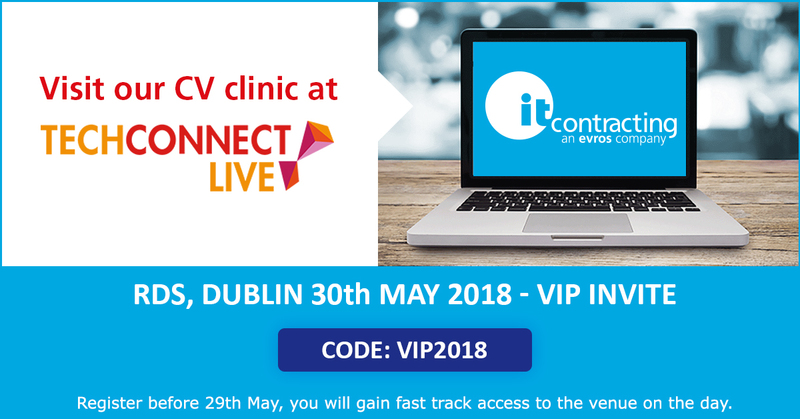 itContracting will be at this year’s TechConnect Live on 30th May at the RDS, Dublin. TechConnect Live in association with Vodafone is Ireland’s largest annual business and technology exhibition for Micro, SME and Enterprise level companies. Join over 5,000 business owners, key decision-makers, entrepreneurs, owners and managers across Ireland at this free one-day event and receive insight into the resources you need to increase your profitability and drive your company forward. Our team of specialised IT recruiters will perform CVPR (CV Professional Resuscitation) on your résumé and reveal insider tips on the critical pressure points of a successful CV. Make the most of this exclusive face-to-face CV review appointment at TechConnect Live 2018! If you’re interested in attending TechConnect Live 2018 on Wednesday 30th May, 9am – 6pm, register now with itContracting.